Property Details: 3 Bedroom, 3 Bathroom Property with 1750 square feet. 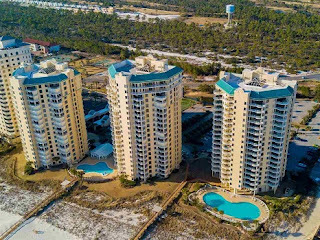 Beach Colony Resort condo for sale in Perdido Key. There is something very special and unique about the sound of crashing waves from 14 stories high! Those peaceful sounds roll in from the oversized curved balcony and into every room indoors. Every spacious bedroom has sliding glass doors and private balcony with stunning views. Large windows in the living room and dining area open up to spectacular views of Perdido Key's barrier island, including Gulf of Mexico and several other waterways. The master suite is magnificent! Enjoy gulf front views without getting out of bed or relax with that same gulf front view from the Whirlpool tub. Beach Colony offers only 4 gulf front residences per floor with gated and security coded elevators. Resort amenities include two outdoor pools, indoor heated pool, fitness center with sauna and steam room, hot tub/spa, tennis courts, and 2 private boardwalks for beach access. This unit is currently generating income in the Meyer Real Estate Vacation Rental Program. Association Management is on-site with healthy reserves and with well maintained grounds.